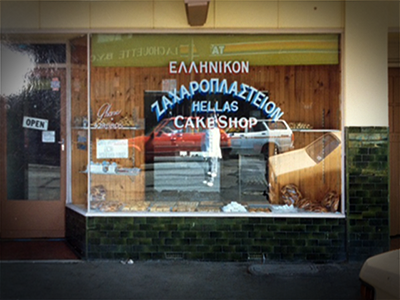 Tucked around the corner from Richmond Station, Hellas Cakes has been baking baklava, galaktoboureko, kourambiethes, tsourekia and other Greek treats for locals, for the past 50 years. 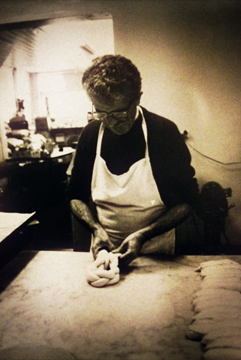 Founded in 1962 by post-war immigrant and pastry chef Iraklis Kenos, in 1970 George Laliotis joined the team, and in 1977 after Iraklis had left to start Hellas Confectionery, a partnership was formed with George Kantaras. 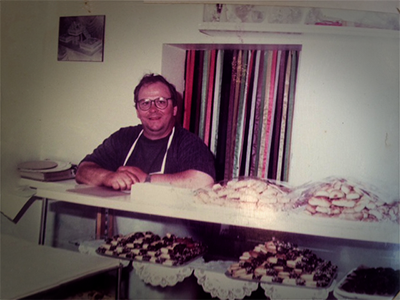 Today the cake shop is managed by their sons Peter Laliotis & Andrew Kantaras, and a third generation of Laliotis' are also being taught Hellas patissiere secrets. While Richmonds Greek Community has dispersed in recent years, Peter and Andrew have remained determined to keep their fathers' business alive and to serve the new generation of Richmond locals. The range of speciality cakes created at Hellas has evolved over the years to cater to changing tastes. Countless Kitchen Aid's which line the kitchen walls, allude to the period when Peter and Andrew used the vast marble benches to teach Patisserie courses for Hales Institute. And in 2012 the bakery expanded its repertoire again, and now serves coffee (Coffee Supreme), breakfast and lunch 7 days a week. The heroic spanakopita does make an appearance on the menu, however, that is about as traditional as it gets. Instead, the café offers an eclectic array of modern café faré, with a focus on quality, fresh ingredients.